This is was only effort this week and I was not happy with it. I tried watercolours again and failed miserably again. It was under the bridge at Swenson Farm Blvd and it was hot. 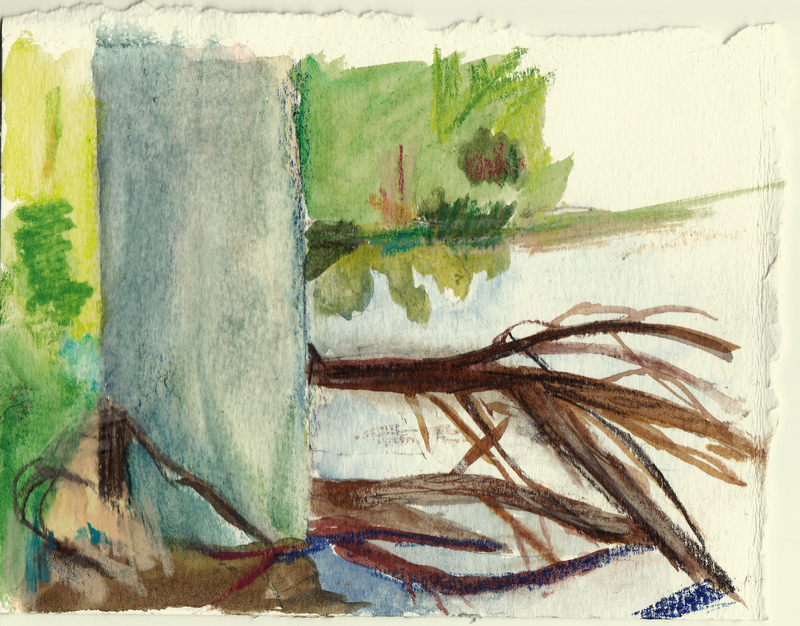 I took a separate small sheet of watercolour paper (about 4×6 inches) I managed to lead against the low wall of a bridge support and used my stool to balance the watercolour palette plus water. Under the bridge at Swenson Farm Blvd – only cool spot. Yet another failure with watercolour. Need a bigger sketchbook. Think I will keep this one for drawing and used a bigger pad next time – Lunchtime! After Monday I really not could face the heat (and sense of failure) and decided it would do me good to take a break for a week, This week I plan to take the car out to the Hill country and explore more of the landscape. We have had a little break for the heat for the last couple of days and it looks like the 100f/38c temps will be history for the rest of this year. Unfortunately it will still be about 95f/ 32c for another few week before the fall temperatures arrive but at least the cooler weather is coming. So this week I have spend semi reorganising my art room. This is a regular event as (1) I am not that tidy (2) I have a lot of stuff and (3) it allows me to reconsider what I am doing. Amongst the stuff I have is most of my old art work, which includes my CSE, O level work and the drawings I did at Camberwell School of art Saturday morning classes. It is good to look at this work as it reminds me that I can draw and the principal of Camberwell was particularly complementary of my drawings. Then I have my art therapy drawings. In 1992 I began to study Art therapy as post grad subject. As part of the course we had to participate in art therapy sessions with other students. It was a very productive 2 yrs for me in drawings and I would love to recapture that level of spontaneity which was sparked by key words, some of which I recorded on the back of the drawings. At first I found it difficult to let go but as the sessions when on the more visceral the experience became. My dreams in particular were very vivid in the last year. It had a profound effect on my relationship with my mother. At first I wasn’t sure it was a good effect as it eventually led to break of 2 yrs and only repaired once we moved to the US. In the end though I had much more honest,loving and to be truthful, more grown up relationship with my Mother . I was also more able to deal with the emotions these memories brought up and relate them to my current life, rather than let them fester in the past. From that I gained more understanding of why my relationship with my mother was different from my sisters and just because they hadn’t experience or reacted to it in the same way, didn’t negate the memory, it was just my memory not theirs. Quite understandably my sisters and I have sometimes butted heads about this, in fact just this summer as it happens. Listening to my own kids, I get the sense of the differences a child within a family can have, often relating to the position they are within that group. Most of the time they have a communal memory but every so often a memory resurfaces that is unique to that child. Anyway before I get myself into trouble I had better finished. I’ve found this post really interesting. I appreciate your honesty and it shows in your sketches and I really think your work is loosening up too. I love the sketch at the top of the post. Please keep going.